A Recent Hope Result is a letter written by Arthur Conan Doyle first published in Light on 7 april 1923. Sir, — Mr. Bird, of the "Scientific American," has been in London lately, investigating psychic matters. He came at my suggestion, and I told him that I hoped I could show him sufficient phenomena to convince him on that, the least important side of the question. He sat twice with Sloan, once with Evan Powell, and once at a very good private circle, and he saw in the space of a fortnight practically every manifestation (save an actual human levitation) which we have ever claimed. Among other things he saw, in bright candle light, the movement of distant objects, and their immediate response to questions or directions. He had the sense to begin his investigate without consulting the mediums either personally or collectively, and he contributed a sympathetic atmosphere which enabled him to get results in this short campaign, which many so-called psychic researchers with their elaborate tests and impossible conditions do not get in their lives. He was intelligent enough to understand that we have to conform to the laws and not expect the laws to conform to us. Finally, I went with him to get a photograph from Mr. Hope. Mr. Bird played no tricks, but, on the other hand, be neglected no precaution, marked his plate instantly when he opened the packet, and never let it leave his on hand for an instant, save when actually attached to the camera. As a result, he received two extras upon his plate. Those of the S.P.R. who have real doubts as to Hope's honesty should surely accept so absolute and independent a test as this, without waiting for a special S.P.R. test, which, in the present unhappy circumstances, must be conducted under strained and artificial conditions. 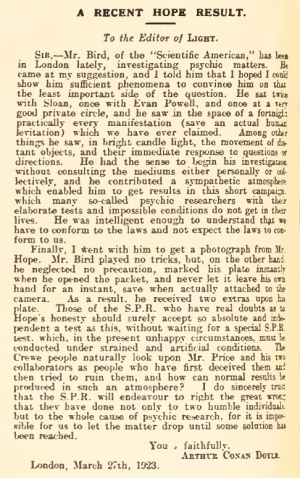 The Crewe people naturally look upon Mr. Price and his two collaborators as people who have first deceived them and then tried to ruin them, and how can normal results be produced in such an atmosphere? I do sincerely trust that the S.P.R. will endeavour to right the great wrong that they have done not only to two humble individuals, but to the whole cause of psychic research, for it is impossible for us to let the matter drop until some solution has been reached. This page was last edited on 19 July 2016, at 15:50.